During naartjie season, you might be forgiven for thinking my house has been invaded by swarms of starving monkeys, so many blazing-orange peels are draped over cushions and tossed in spirals on the carpets. I exaggerate, of course, but my kids do love naartjies [a South African word for tangerines or clementines] and they eat them by the bucketload in winter. Dried naartjie peel adds a lovely old-fashioned fragrance to milk tart. I've no doubt that a similar surfeit of naartjie peels led early cooks at the Cape to dry these fragrant skins and pound them to a powder to use in both savoury and sweet dishes. References to dried, ground naartjie peel abound in old South African recipes: 'No well-stocked 18th or 19th century kitchen was without a jar of dried naartjie peel,' write Magdaleen Van Wyk and Pat Barton in their book Traditional South African Cooking (2008). In her esteemed cookbook Traditional Cookery of the Cape Malays (1959) Hilda Gerber gives a recipe for koesisters that contain 'a little stamped dried naartjie peel'. A similar recipe for koesisters appears in the Cape Malay Cookbook by Faldela Williams. A recipe for 'Krapkoekies' [literally, 'scratch biscuits'] in The Imperial African Cookery Book: Recipes from English-Speaking Africa by Will Sellick contains both dried naartjie peel and cardamom. Dried naartjie peel was also used in oublietjies (light, crisp wafer-like biscuits bought to South Africa by the French Huguenots; these were cooked in a special waffle iron and rolled to form a cylinder) and in sweets. In his book Tavern of the Seas, famous raconteur Lawrence Green wrote, 'For the children there would always be tameletjies, the sweets made of sugar, water, eggs, naartjie peel and dennebol pits.' What Green calls 'dennebol pits' are denne pitte, or pine nuts. Tameletjies are a type of nutty, sticky toffee, also known as stick-jaw or sticky jaw. According to Van Wyk and Barton, tameletjies have been eaten at the Cape since the early days of the French Huguenots: 'Years ago, these sweets were sold by Malay street vendors but these days they seem to be made only for special private feasts.' Here's their recipe for tameletjies. Dried naartjie peel - along with fresh - was probably used in early versions of Van Der Hum (a famous South African liqueur made of brandy, spices and naartjie peel) and it's also occasionally used as a flavouring in savoury dishes, including bobotie, spicy dish of custard-topped mince that is regarded by some as South Africa's national dish. Here's a contemporary recipe for a lamb potjiekos (pot-stew) containing dried naartjie peel. I oven-dried a whole lot of naartjie peel recently and have had great fun experimenting with this unusual ingredient. It has a lovely pungent aroma and is delicious combined with other spices such as nutmeg, mace, cardamom, cinnamon and cloves. The ground peel does have a fleeting bitterness (no doubt due to the fact that I dried it without removing its white pithy underside) but it is not at all unpleasant. I suppose you could use a potato peeler to shave off pithless flakes of the peel, but this is a laborious business because naartjie peel is so oily and flexible. To dry naartjie peel, place the peels - torn into big strips - on a rack in a sunny place and allow to air-dry naturally. Or, if you're in a hurry, put them on a rack set over a baking tray and place them in the oven. Turn the oven to its lowest setting and allow them to dry out overnight, or until they are quite crisp. The peels will dry out faster in a fan-assisted oven. Store the peels in an airtight jar and use a coffee grinder or a mortar and pestle to blitz a few pieces to a powder whenever you need them for a recipe. 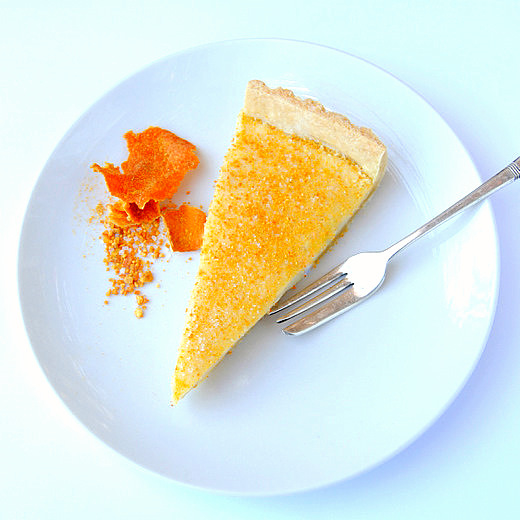 By far and away the most famous dish using dried naartjie peel is milk tart, or melktert. Most modern recipes call for a piece of fresh naartjie peel to be placed in the milk to infuse, but older recipes incorporate the dried, ground peel into the mixture. I like a delicate, wobbly, custardy milk tart, but my kids do not; their tastebuds have been ruined by flabby white supermarket milk tarts containing not a trace of egg and far too much cheap cinnamon. This recipe is a compromise (and I've added some cream and a vanilla pod for extra decadence). Milk tarts are traditionally made with flaky or puff pastry, but I prefer a shortcrust pastry. You can make your own - recipe here - or use a good frozen pastry of your choice. Put the milk, cream, naartjie peel, vanilla pod and cinnamon quill in a large saucepan, place over low flame and bring very slowly to the boil. As soon as the milk begins to seethe and rise in the pan, remove it from the heat, cover and set aside for 15 minutes to infuse. Strain the milk into a jug or bowl and discard the peel, vanilla pod and cinnamon. Break the eggs into a mixing bowl and whisk them lightly. Add the flour, cornflour, caster sugar and one-third of the warm, strained milk. Beat together, using a wire whisk, until quite smooth. Pour this mixture back into the saucepan and add the remaining two-thirds of milk. Cook, over a low flame, stirring constantly, until the mixture is thick and smooth; it should have the consistency of a thick white sauce. Don't allow the mixture to boil. Pour the mixture into the prepared pie dish and bake at 160ºC for 25-35 minutes, or until the filling has set, but is still rather wobbly in the middle. Remove from the oven and allow to cool. Put the ground naartjie peel and caster sugar into a tea strainer and sift this mixture all over the top of the tart. I wonder why I have never heard of this before? (since I grew up in South Africa) Definitely on my to do list now - it sounds delicious. Your milk tart recipe is almost the same as mine, but since I am diabetic I use non fat milk, and it is still very tasty. Sounds like a great extra thing to preserve from winter. I love the extra tang of naartjie in my marmalade, it's got a little something extra compared to orange zest.... but yet another thing to add to the preserving list - I still haven't made the candied orange peel that I was going to try this winter. Hope the citrus season will keep going a while longer, despite the crazy warm weather! Do you think I could use a puff pastry base? alot of the recipes I have found call for puff pastry, even though I remember the short crust version. Any suggestions? sorry, I hadn't read the entire post - I see you did mention the puff pastry! I have to be honest, this is the first time I've heard of naartjie peel in milktart, but I must say I am quite in favour of the idea! I really should dry our citrus peels as well - I too eat a bucketload of naartjies, minneolas and oranges in winter. Dear Penny, thank you very much for your comment. I'm so glad my milk tart warmed the cockles of your heart!